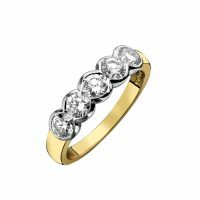 Diamond 5 stone rub-over ring, 1.06cts 18ct gold mount - Connard & Son Ltd. 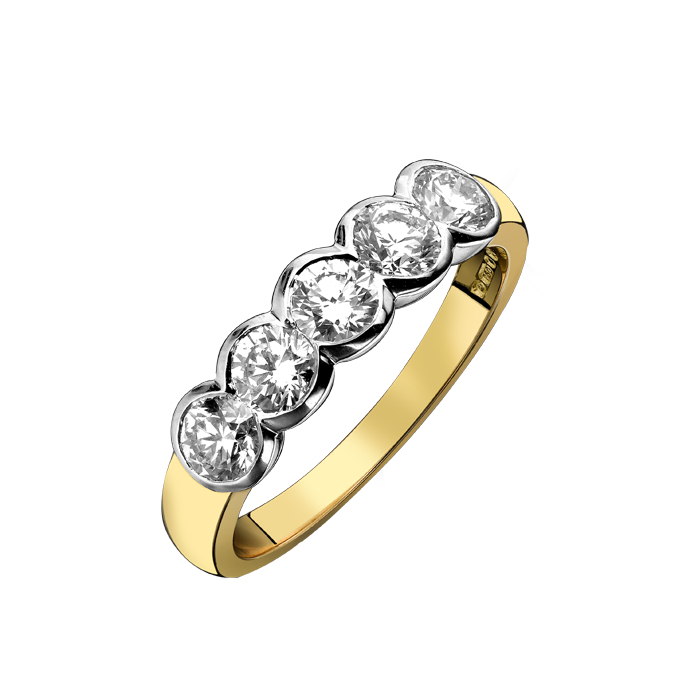 This classical design of ring has never changed over the years and always looks lovely when worn. The larger size of diamonds normally cover the lady's finger from one side to the other. This ring has 5 equal sized modern brilliant cut diamonds all set in a smooth 18ct white gold rub over mount with the edge of each diamond literally kissing each other. The shank for this is slightly wider where it meets the white gold, and narrows toward the back, although it is a slightly heavier mount than is used on some of our other rings, but it does look better on this style of ring. This ring can be altered in finger size a certain amount, but too many sizes and it would require a new ring being made in your finger size, which would take a few weeks.